Fall is already here and we are enjoying seeing the trees start to turn from green to orange and yellow. This tree is a sugar maple and is the first one to put on a show in our neighborhood. With the yellow leaves comes the big yellow school bus. 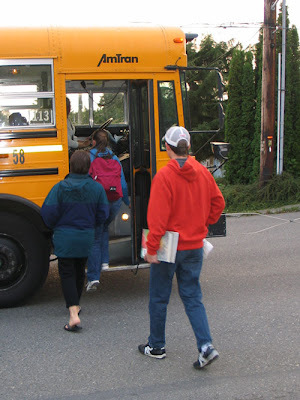 When our children were still babies, I used to tease Heidi about having to put them on the school bus and watch their tear stained faces pull away. Well, it never happened, our children did almost all of their schooling around the kitchen table. This year, things are a bit different. You can see this in the picture. To me, it looks like Heidi is pushing them onto the bus. Perhaps not, but anyway, there are no tears. James and Carrie are enjoying their classes at Black Lake High School. Thomas has also started school. He is going to Cornerstone Christian School. 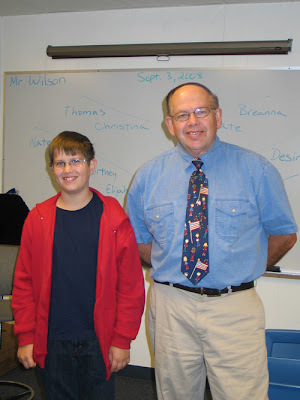 In the picture, he is standing with his science teacher, Mr. Evatt. I, Jonathan, am one of his teachers. I'm teaching a missions emphasis class two days a week to 19 Jr. high students. Charles will start a few college classes next week and Heidi and I will be taking some correspondence classes as well.